My mom is brilliant; why on earth didn't she become a photographer?! Yes, this is a homemade photo, just before the start of my senior year -- I graduated in '06, so this is a few years old. Music, for the most part is my life. Try to take it away, & you're asking for an early death. Other than that... A pleasure to meet you, whomever you may be. 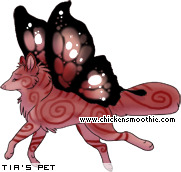 Adopt virtual pets at http://www.chickensmoothie.com ! -- Your bedtime: "Ooh, that pillow is soft", or "Aw, my puter overheated again!" -- Adidas or Nike: SKECHERS! -- Have a crush(es): A few. -- Do you think you've been in love: Believe so <3 <3 Still am. -- Like high school: I miss it. -- Want to get married: Absolutely! -- Believe in yourself: Sometimes. -- Played a game that required removal of clothing: Strip poker. I lost badly. -- Been caught doing something: Doing what? -- Changed who you were to fit in: Nope. -- Best hair color: The color I can run my fingers through. -- Short or long hair: Short-ish. -- Height: Somewhere between short enough to motorboat my chest and tall enough to rest the chin on my head. -- Best weight: Doesn’t matter. -- Best articles of clothing: Any shirt with buttons, and jeans. -- Number of drugs taken illegally: Not touching that one. -- Number of CDs that I own: Legal ones or burned ones or both? -- Number of tattoos: None. Yet. -- Number of scars on my body: 2 from stitches.